Tonight was the second of our scheduled monthly training meetings. 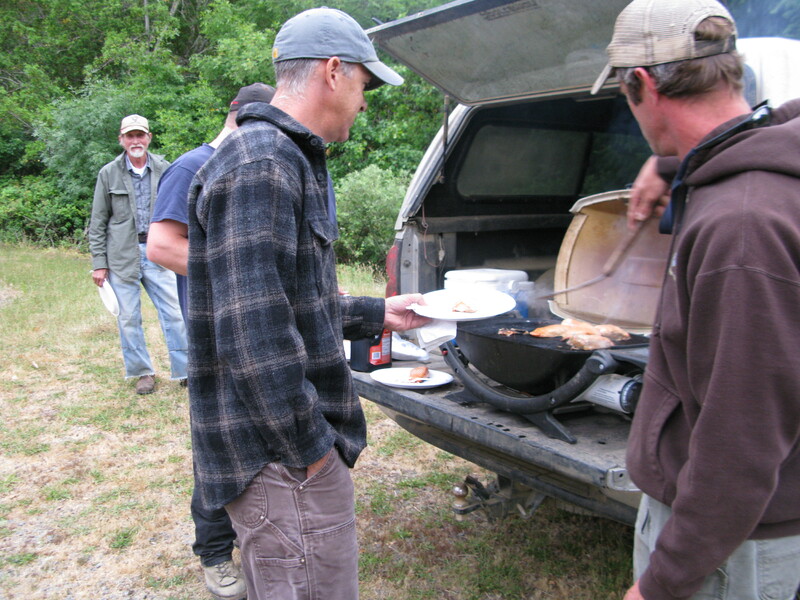 Turnout was a bit sparse, so after a very short bit of administrative business, we all retired to the parking lot for a couple of delicious servings of buttery salmon with teriyaki sauce that Eric cooked up right there on the tailgate. Eric often travels with a cooler full of fresh-caught salmon and his grill. Not to rub it in for those of you who couldn’t be there, but it sure was good. Mmmm! And, by the way, as I was posting this, BVFD Chief Olsen responded, along with Telegraph Ridge Fire, to an emergency medical aid call just up the road near Ettersburg Junction. They rendezvoused with the ambulance and the patient who was being driven toward the hospital in a private vehicle. BVFD volunteers enjoying an impromptu salmon dinner at our fire station bi-monthly meeting. Briceland VFD be providing fire, rescue, first aid and other emergency services this weekend at the Mateel Community Center’s annual Reggae On The River music festival at Benbow Lake State Park just south of Garberville. We’ll be stationed to the right of the main stage, back toward the main entrance. Look for one of the marked emergency vehicles and come say hi. Saved by seatbelts and a tree. 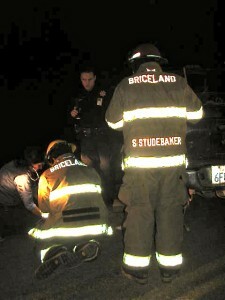 Four BVFD volunteers responded to a call of a vehicle over the bank at China Creek Rd. this morning around 9am. According to the driver, he was run off the road while traveling westbound by another driver in his lane who was trying to pass an eastbound truck. 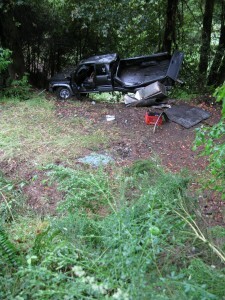 Despite the truck rolling over and being totaled, the driver walked away unhurt. The tree in the photo prevented the truck from dropping over another 30′ embankment. CHP arrived at scene shortly after BVFD volunteers and we were released from scene. Also, last night, our sister department, Telegraph Ridge VFD, responded to a vehicle fire on Ettersburg Road that started a small vegetation fire. Luckily the rains had started hours before and the grass and brush is still green enough that the fire never spread. Another week or two and it could have been a major wildfire. Best fire department food in the county, available till 7pm. We’re having our annual All Fired Up event this Sunday, 3-7 p.m. There will be lots of food, including barbecued albacore, hamburgers, veggie burgers, cookies and desserts. You can bring your fire tools such as shovels, McCleods and Pulaskis to get them sharpened. Bring your fire extinguishers to get them check and refilled if necessary. If you need fire tools, you can order them on Sunday through the Department. This is also a great opportunity to meet Department volunteers, sign the Fire Protection District petition or learn more about it and learn more about plans for the new fire station. 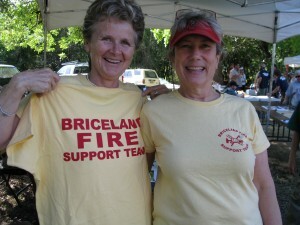 Briceland Fire Support Team t-shirts available today. For more info, click on the link below to listen to the KMUD local news broadcast from Friday, June 10th, 6pm where BVFD Chief Tim Olsen talks about the event, the new station and the proposed Fire Protection District. As in past years, the BVFD crew will be at Summer Arts the entire weekend, being on-call in case of any emergencies. We’ll have our ambulance and fast-attack Type IV engine not far from the entrance. Stop by and say hi! Briceland Volunteer Fire Department has relied on community support in the form of donations and fundraising events since its inception. For a variety of reasons, this funding is no longer adequate, so we have proposed the formation of a formal fire district that would levy an $85 parcel tax to give the Department a stable income base. For more detailed info, see the page Fire Tax: Questions And Answers. The first step in the formation of the district is to get the proposal on the ballot. We need a minimum number of signatures to do this. This is an official election petition, so must be signed in the presence of someone authorized to collect the signatures. The petitions can be found at the Beginnings, Inc. office at the octagon in Briceland during normal business hours or occasionally at the fire station on Briceland Road when someone is there with the doors open. Please sign the petition and then encourage all your neighbors to vote yes on the mail-in ballot later this year. Help us to be able to keep gas in the fire truck and provide us volunteers with proper protective equipment and training so we can serve our community. Thank you! Chief Tim Olsen and Captain Allison Jones (also a paramedic-in-training) happened to be the first ones at scene at about 10:30pm and called in the incident to dispatch. Shortly thereafter, we had nine responders (including several EMTs) and our Type III engine, 5436 at scene. BVFD EMT/firefighters treating a patient at scene. Both drivers were taken away by ambulance, Brown’s Towing removed the vehicles, the two CHP officers did their reports and traffic control, we swept up the debris off the road and went home. This is the kind of thing we do with (unfortunate) regularity, on our own time and for free. While we as individuals don’t get paid, we do need to purchase and maintain our equipment, keep up-to-date on our training, put fuel in the fire truck and so on. Please sign the petition (at the Beginnings office or at the fire station) to form a formal fire district to help us maintain this level of service to the community. EMT Briceland Volunteer Fire Dept. 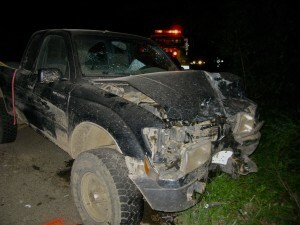 One of two vehicles involved in the collision. Support our local sister organizations upcoming fundraisers! Southern Humboldt Technical Rescue is holding their annual fundraiser as well. They need to raise money to buy a new rescue vehicle. Telegraph Ridge, the volunteer department just to the west and north of Briceland’s district is having their annual fundraising barbecue. You can RSVP or leave comments on the Facebook event page. This is a family event! Live music and fun for the whole family. 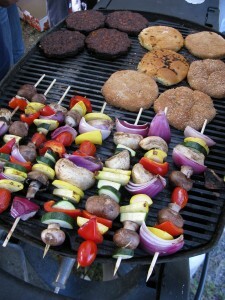 There will be awesome barbecue food for purchase along with tempting deserts. Everyone is welcome and encouraged to come and support our local fire department. Crew meeting tonight, Beginnings octagon 6pm.